If anyone living in the village of Möggingen, Germany, had taken a close look at a bumblebee in the summer of 2009, they might have noticed something a little strange. Some of the bees were wearing what looked like small silvery backpacks with 3-inch antennae, zipping between trees and flower heads. A scientist followed discreetly behind. 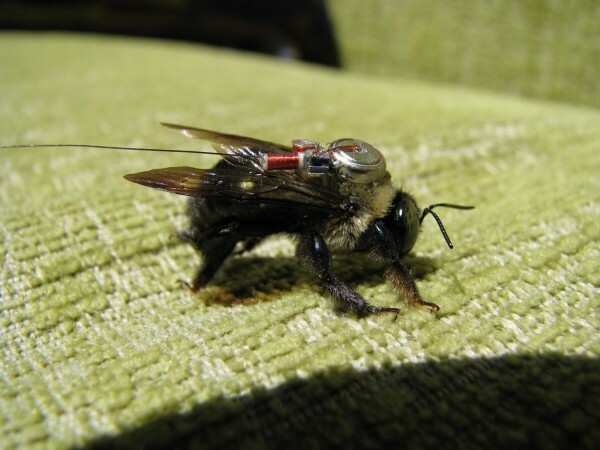 The bees’ accessory was a tiny transmitter with a radar-detection range over a third of a mile. For the first time, Dr. Martin Wikelski and his colleagues at the Max Planck Institute for Ornithology succeeded in tracking bumblebees as they alighted on pear trees and nipped across meadows in idyllic and rural Germany. The study found that the bees flew up to 1.5 miles and explored areas over 100 acres, repeatedly visiting the same tree or flower patch to rest or forage. The poor bees were working hard. Given that a bumblebee weighs about 300 milligrams, packing the transmitter was the equivalent of a 150-pound person spending each day with a 100-pound barbell strapped to her back. 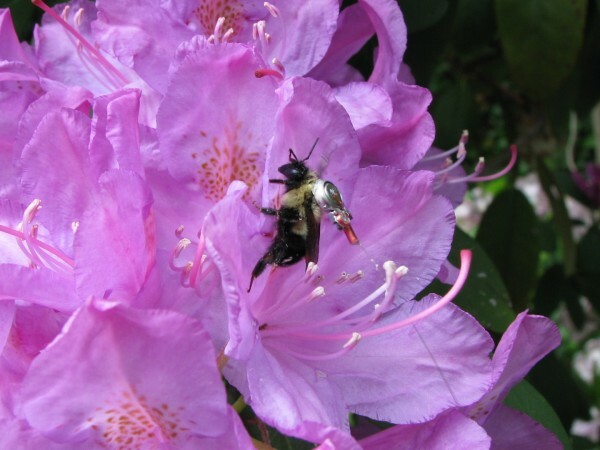 The backpacking bumblebees were not only a curious sight but a potential model for solving a puzzling biological mystery, colony collapse disorder (CCD), which is decimating honeybees, the bumblebees’ smaller cousin. The seasonal epidemic eliminates at least one-third of all commercial honeybee colonies in the United States each year. This past winter, 45 percent of U.S. beekeepers, including backyard beekeepers, watched their bees abandon their hives, a 78 percent increase over the previous year, according to an annual survey funded by the U.S. Department of Agriculture. Some of the bees were wearing what looked like small silvery backpacks with 3-inch antennae, zipping between trees and flower heads. Current radio trackers aren’t small or light enough to attach to honeybees, which weigh roughly a twelfth of a gram, or 120 mg, slightly more than a fat raindrop. But Wikelski, who in a previous position at Princeton pioneered the use of radio tags to track cicadas and dragonflies, says tracking technology continues to shrink. He predicts transmitters could be small enough to track honeybees in about five years. Based in Germany, Wikelski is the founder and director of the Icarus (International Cooperation for Animal Research Using Space) Initiative. Beginning in 2015, Icarus will record animal movement, particularly that of small animals, via an antenna on the International Space Station. It will outfit 5,000 to 10,000 animals with GPS tags that relay data to the Icarus operations center. Icarus plans to chart how animals alter their migration routes as the planet warms and how invasive species affect ecosystems. Discovering key stopover sites for endangered species, Wikelski says, could identify new habitats for conservation. It could also lead to unexpected discoveries. Last November, Wikelski learned about a telecom blackout in war-torn Syria when he lost contact with white storks wearing tracking devices that operate in a cellphone network. He had been tracking the storks across Africa and Western Asia. 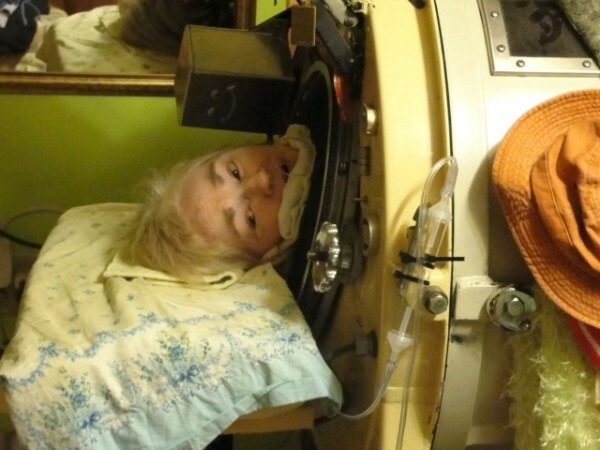 Despite years of analysis, scientists still can’t pinpoint the causes of CCD. A leading candidate is the Nosema virus, a fungal spore that forms in the gut and causes diarrhea, which spreads the virus. Researchers are sharpening their focus on a ubiquitous class of agricultural pesticides called neonicotinoids. Two papers from 2012, one by a group of scientists with the USDA’s Agricultural Research Service and one from the University of Florida, demonstrated that the nicotine-derived pesticidemakes honeybees more susceptible to the Nosema virus and canalter the gene expression of honeybees exposed to Varroa mites, the leading cause of domesticated honeybee loss. Although lab results are mixed, several studies have shown that exposure to neonics, as they are called, can make bees dizzy and confused, shaky and hyperactive, and can affect their ability to forage under laboratory conditions. She catches bees and coats them in a glow-in-the-dark fluorescent powder, then releases them onto a hedgerow. Honeybees aren’t too difficult to follow. They tend to forage within a couple miles of the hive and to visit a particular food source—a field of flowers, say—again and again, loading up on nectar and pollen until the supply is exhausted. One-third of the food we eat—from beets and broccoli to apples and almonds—is pollinated by one species of commercially-raised honeybee, Apis mellifera. In 2007 and 2008, an international team of scientists based in Australia employed tiny RFID (radio-frequency identification) tags, a transponder that emits a signal using short-distance radio waves and requires no battery life. They glued the lightweight tags onto the bees and set up a scanner at the mouth of the hive. Bees sent a signal when they left and entered the hive. The readings showed how many trips a bee made each day. In one study, scanners were set up at a hive and an artificial food source was treated with pesticides. Pesticide-dosed bees reduced their foraging habits and took more time to fly between hive and food. The RFID tags, however, were not able to follow bees in the field, as the Icarus Initiative plans to do. Dr. Claire Kremen, a conservation biologist at University of California, Berkeley, has her own whimsical tool to follow bees in the wild. She catches bees and coats them in a glow-in-the-dark fluorescent powder, then releases them onto a hedgerow. She and her team wait until nighttime and hike out to the field with UV glasses, looking for traces of pink, blue, yellow, and green—sprinkles of dye on the flowers the bees visited that day. Jeff Pettis, head of the U.S. Department of Agriculture’s Bee Research lab in Beltsville, Md., says tracking bees with transmitters “sounds like a very valuable tool.” He suggests the best use for bee tracking could also be the simplest. When a bee colony collapses, the bees fly away to die—a natural instinct to avoid infecting the rest of the hive. But it makes postmortems a challenge. “If we were able to recover more dead bodies, we could see that the bees that died away from the hive had a higher virus load than those in the hive, or in nearby hives that appeared healthy,” Pettis says. And that would help determine where the problem started. Still, bee tracking has its skeptics. “I think it’s going to be extremely difficult to do,” Mussen says. With more than 1,000 eggs laid in a hive every day, he asks, how could a scientist choose which bees to track? Mussen says the tests may result in a lot of disappointed researchers, who will find transmitters attached to a bee thorax left behind by a praying mantis or in the stomach of a hungry songbird. Mussen wants to know how scientists would draw a correlation between pesticide exposure and bee behavior. Farmer A may grow a field crop with a certain pesticide, but what if the bee also alighted in Farmer B’s neighboring field? Scientists would need to follow a bee’s every move and intervene to avoid cross-contamination. “The only way you could isolate the pollen loads would be to continue netting the bees that are visiting Field A and keep knocking their pollen loads into a vial,” Mussen says. The tests may result in a lot of disappointed researchers, who will find transmitters attached to a bee thorax left behind by a praying mantis. While Icarus has tracking honeybees on its drawing board, it has to wait for the development of a radio transmitter that weighs no more than 20 percent of a honeybee’s bodyweight, an infinitesimal 24 mg, the weight of the RFID tags used by scientists in Australia. Fabricating a transmitter that small, with its own battery source to generate radio waves, would be difficult but possible, says Michel Maharbiz, an associate professor with the Department of Electrical Engineering and Computer Science at University of California, Berkeley. “At the moment there’s a practical limit to how small a battery you can get,” Maharbiz says. “There are a lot of research efforts that can make them smaller. But you can’t go buy a 50-milligram lithium polymer battery off the shelf.” However, adds Maharbiz, the market for personal telemetry transmitters, like bracelet pedometers that send a signal to your cell phone, is booming, and companies are racing to develop smaller and more powerful silicon chips for new applications. Julia Scott is an award-winning journalist and radio producer whose work has been featured in Best American Science Writing. Her stories have appeared in the New York Times, Modern Farmer, and on Marketplace and the BBC World Service. This program is part of the STEM Story Project — distributed by PRX and made possible with funds from the Alfred P. Sloan Foundation. Special thanks to the March of Dimes for its archival newsreel. The March of Dimes Foundation is a United States nonprofit organization that works to improve the health of mothers and babies.